For customers who enjoy making their own ID badges, we offer a complete selection of the best card design and visitor management software products available. These programs allow you to create unique, professional ID badges for your organization from basic name badges to complex and highly secure smartcards. For customers who enjoy making their own ID badges, we offer a complete selection of the best card design and visitor management software products available. These programs allow you to create unique, professional ID badges for your organization from basic name badges to complex and highly secure smartcards. We offer card design software from Jolly Tech, Asure ID, CardStudio and CardPresso. Please click on the links below for additional information on each. Innovative Photo ID Card Software – Incorporating an advanced information management platform, database connectivity, design and automation tools, ID Flow offers more productivity and flexibility to users than any other solution available in the market. ID Flow is Jolly Tech’s innovative, ID software solution for the management and printing of secure ID cards for small businesses to large enterprises. Enroll and manage cardholder records, print secure, photo ID cards and badges and create detailed reports with the industry leading photo ID card software. Jolly Badger is a light version of the software that comes bundled with select ID Flow complete systems. Trusted worldwide by organizations of all sizes, the HID Asure ID suite of products offer photo ID and ID card application control software solutions that are easy to learn, feature rich and capable of enabling the next generation of ID card applications. 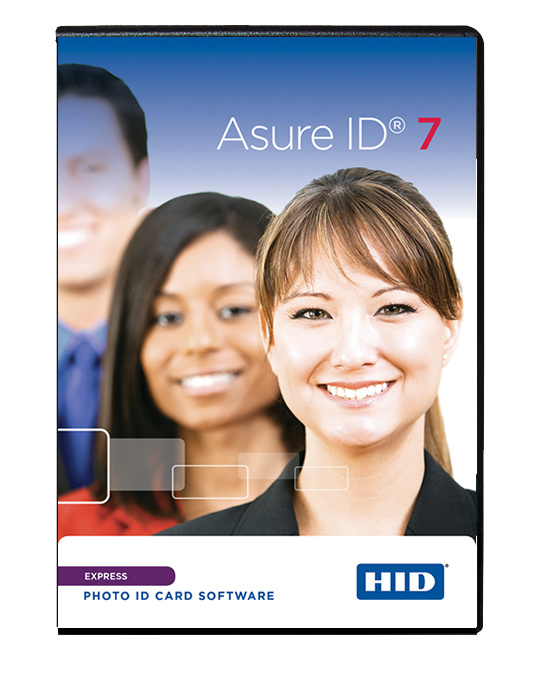 HID Asure ID Solo™ is great for organizations looking for an entry level photo ID card software that provides quick and easy single sided card design and print production. HID Asure ID Express™ is the ideal choice for organizations looking for an affordable, powerful and easy-to-use stand alone photo ID card software with advanced card design and batch printing capabilities. HID Asure ID Enterprise™ is the perfect photo ID card software for organizations that operate over a corporate network. Multiple operators and different departments can easily create, update and maintain multiple shared records in real time. HID Asure ID Exchange™ is the perfect photo ID and ID card application control software for organizations seeking intuitive card design, data management and advanced card personalization. Powerful integration, enrollment and encoding modules ensure a quick and seamless gateway with other existing database and network applications. Zebra ZMotif CardStudio is an easy-to-learn, easy-to-operate professional card design and card issuance software suite. Whether you’re creating simple or complex designs, CardStudio offers a version for every application with three editions: Classic, Standard and Professional. Optimized for use with all Zebra card printers—including both direct-to-card and retransfer—CardStudio makes designing, encoding, printing and connecting to databases fast and efficient. Upgrades from the Classic and Standard editions to the Professional edition are available with the simplicity of a software license key. Face Snap plug-in is also available as an option for automatically cropping and optimizing images for production. Upgrades to the Professional edition are available with the simplicity of a software key. CardPresso ID card software is available in five Windows and MAC OSX compatible versions. The versions are easily upgradeable with a license key to accommodate all project needs. CardPresso allows connection to databases for card personalization in a user friendly way. XS adds, among other features, .XLS, .CSV, and. TXT database connection, database view and link image to DB field. Additions include local MS Access connection, photo on database, face crop tool for face recognition, 2D barcodes and smartcard plugin. Includes ODBC connection, RFID contactless direct encoding, multi-layout card designs, conditional printing, operation logs, and much more! Many clients ask for ways to manage the visitors they receive daily at their businesses, schools or events. We offer a variety of solutions. One great way to manage those visitors, is by using a visitor management software. One of our partners, Jolly Technologies, offers a management software program, we highly recommend. The management software program, Lobby Track, can track and register: (1) visitors; (2) event attendees; (3) students; (4) members; and (5) employees and contractors. This registration can be completed on-site, online via your company’s intranet or at a self-registration kiosk. In connection with the registration process, Lobby Track can complete a number of other functions, including: (1) scan driver’s license or passport to auto-fill registration forms; (2) capture a photo of the registrant as well as any necessary biometrics; (3) check the registrant against local and online watch lists; and (4) require that the registrant sign a non-disclosure agreement. Once your visitors or attendees have been registered, Lobby Track allows you to design and issue identification cards, badges and passes using the software’s integrated badge designer. Lobby Track includes several pre-designed templates that make it easy to issue expiring badges or plastic ID cards. Watch the Intro to Visitor Management Video. For additional information on Lobby Track, please click on the link here. Pricing for Lobby Track varies according to the version that most meets your needs. * Must be used with one of the other networkable Editions for configuration. EasyLobby SVM™ (Secure Visitor Management), provides comprehensive, enterprise-class visitor registration, tracking, reporting and badge printing, as well as web-based pre-registration by employees, access control integration, package and asset management, and employee time and attendance. 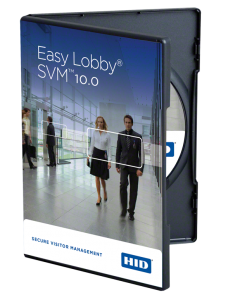 EasyLobby’s SVM software and systems are ideal for all: large and small companies, governmental agencies, office and residential buildings, hospitals, universities, K-12 schools and others. SVM Software is the main application for processing visitors (ID scanning, record creation, badge printing, check in and check out, etc.). Customers will need 1 copy of SVM for every workstation (Windows XP or 7) where they wish to create new visitor records, print badges, etc. SVM database (MSDE, SQL Express, SQL Server or Oracle) can reside on any computer on the network (server is recommended), and any number of SVM workstations can share a central database. For additional information on Easy Lobby, please call us (317-488-1030) or email us at [email protected]. Pricing for EasyLobby SVM varies according to the version that most meets your needs.